The New Jersey Meadowlands, despite decades of neglect and overdevelopment, remains the largest remaining wetland system in the region. It is also likely to be one of the first places to be permanently inundated from sea-level rise. The state should work with the federal government to make the Meadowlands a national park to demonstrate how properly managed natural landscapes can help mitigate the impacts of climate change. A national-park designation would also help preserve and restore the Meadowlands’ natural habitats, protect nearby communities, and make it a recreational resource for the entire region. The immense concentration of infrastructure that exists in the Meadowlands—warehousing and distribution facilities, commuter and intercity rail, roads and bridges, energy transmission facilities—is vital to the economy and transportation needs of the tri-state region, and indeed the entire Northeast. 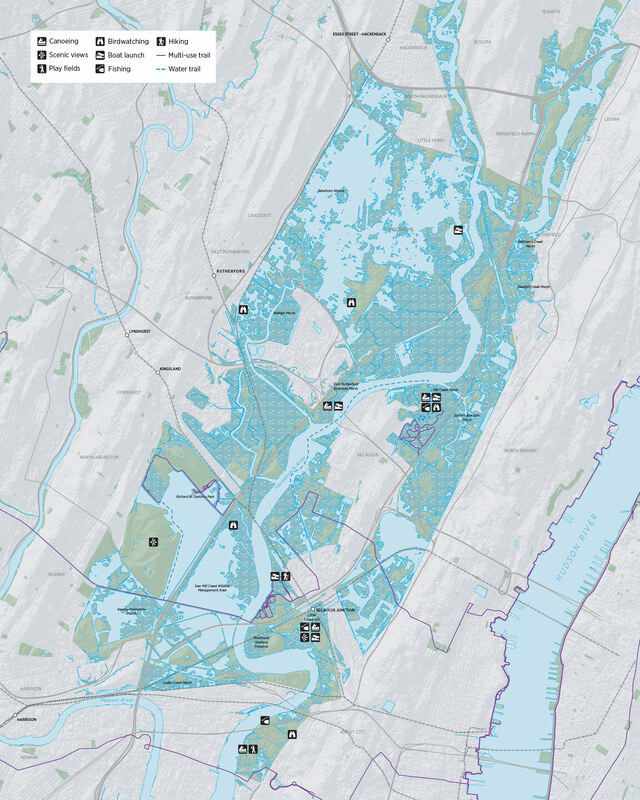 But by the end of this century, permanent flooding from sea-level rise will likely displace between 4,000 and 8,000 Meadowlands residents, and cost 51,000 jobs (as defined by today’s district). The lives of another 40,000 people will be disrupted by periodic flooding from increased precipitation and storm surges, while infrastructure will be threatened by more frequent flooding and saltwater intrusion—a particularly vexing problem given the area’s concentration of hazardous-waste sites. The Meadowlands is one of the Northeast’s largest remaining contiguous tracts of urban open space, one that supports a wide array of wildlife and biodiversity. Although it is a scarred vestige of what it once was, the Meadowlands still provides critical ecosystem functions, including nutrient cycling and flood storage, while supporting critical fish and wildlife biodiversity. The Meadowlands has been designated as a regionally significant natural resource by the U.S. Environmental Protection Agency and the U.S. Fish and Wildlife Service. As the impacts of climate change accelerate, the natural and human communities of the Meadowlands will face even greater risks, putting in jeopardy the natural and human-made systems connected to it. National parks are typically selected for their natural beauty, unique archeological features, or historical significance. The Meadowlands represents a new opportunity for the National Park Service to identify and promote the value natural landscapes can provide in protecting people from the effects of climate change. Designating the Meadowlands a National Park would make a strong statement about the role public institutions can play in climate change resilience. Leadership from the public sector on climate change has been inconsistent. The National Park Service, among the more well-established and trusted institutions in the country, could turn the tide and persuade other agencies to prioritize climate resilience. With other urban coastal areas around the United States facing similar challenges, the park would provide a model that is consistent with the mission of the National Park Service. It would preserve a unique ecosystem and one of the most battered natural systems in the country. It would educate the public on what urban wetlands mean to us today, and how climate change could redraw coastlines in the future. And it will inspire this and future generations to protect these vital assets and develop innovate ways to adapt to a changing environment. A national-park designation would provide the resources and legal framework to help the Meadowlands’s unique ecosystem recover from its industrial legacy, and restore the wetlands and other natural features that would help absorb floodwater from storm surges as well as rising seas. Park boundaries would grow as seas rise. A national park at the Meadowlands would also provide a unique opportunity to both educate local and national visitors about the effects of climate change, and strategize how to mitigate its effects—all in an urban context, where some infrastructure is too critical to be removed, but can be rebuilt to higher standards of resilience. In order to become a National Park, the State of New Jersey, the federal government, and local Meadowlands stakeholders—residents, workers, business owners, infrastructure managers, and other local institutions such as the Sports and Exposition Authority and the Meadowlands Conservation Trust—must first reach consensus on a vision for the Meadowlands, and a plan to get there. A new master planning process for the Meadowlands District should be stakeholder-driven and aim to develop a vision and timeline for the new National Park. The State of New Jersey and park advocates should work closely with the National Park Service and members of Congress to begin the process of getting the Meadowlands designated as a national park. The National Park Service will perform a special resource study to determine the area’s potential, after which the sponsoring lawmakers can introduce legislation in Congress. As the study and potential legislation are considered, the State of New Jersey, the Sports and Exposition Authority and the Meadowlands Conservation Trust, and municipalities within the designated boundary should prepare to transfer all parks, protected wetlands, vacant land, and landfills, as well as relevant state-owned property (approximately 10,000 acres) to the federal government to serve as the foundation of the new national park. Federal funding should be secured to buy out owners of property to be added to the park in phases, starting with the land at greatest risk of flooding. Additionally, federal funding should be used to pay for improvements in and around the park, including contaminated site cleanups, public access infrastructure, and educational signage—complementing and leveraging financial commitments made by New Jersey. A Meadowlands National Park would offer a unique opportunity to restore a significant natural system, and turn the risks and challenges of climate change into a national asset. The park would help protect residents and businesses. It would also introduce a groundbreaking model of a national park that could be replicated across the country. Galvanizing support for the Meadowlands as a new model of a national park will require focused regional, state, and municipal planning and advocacy. An initial vision could be developed with foundation funding and used to inform the master planning process, which will be funded by the state. Once a consensus vision has been reached, efforts to secure federal funding for improvements and infrastructure adaptation can be made. A Meadowlands Buyout Program, created in partnership with the state of New Jersey and the federal government could aggressively buy out high-risk properties in communities like Teterboro, Little Ferry, and Moonachie, transferring purchased land to the National Park Service. Once active, funds from the state Adaptation Trust Funds could leverage funding opportunities in the Meadowlands.